Alex Wolff Photos, News, and Videos | Just Jared Jr.
'Jumanji' Stars Confirmed to Return for Sequel! If you loved the movie Jumanji: Welcome to the Jungle as much as we did, then you’ll be excited to find out that the four actors who played the high school characters will return for the upcoming sequel! 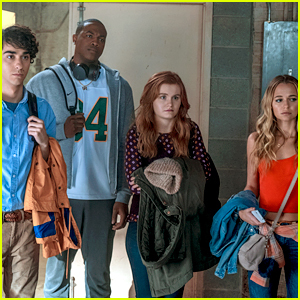 No details are known so far about the movie, but we do know that Alex Wolff, Ser’Darius Blain, Morgan Turner, and Madison Iseman will reprise their roles. Jumanji: Welcome to the Jungle grossed nearly $1 billion at the worldwide box office and was a surprise smash hit. Amandla Stenberg steps out for the 2019 Los Angeles Online Film Critics Society Award Ceremony held at Taglyan Cultural Complex on Wednesday night (January 9) in Hollywood. The 20-year-old actor was joined by Alex Wolff and Eighth Grade‘s Elsie Fisher at the second annual event. Amandla just recently opened up about one of the most important scenes in The Hate U Give – where Chris tells Starr he doesn’t “see color”. Nat & Alex Wolff's New Movie 'Stella's Last Weekend' Is A Family Affair! Nat and Alex Wolff snap a photo with their mom Polly Draper at BUILD Series on Tuesday (October 9) in New York City. The family trio stopped by to chat about their new movie Stella’s Last Weekend, which was also written and directed by Polly. Their dad Michael composed the music for the film. Also pictured: Alex, Nat, and Polly premiere Stella’s Last Weekend the night before at the New York Film Festival. Alex Wolff gives brother Nat a kiss on the cheek while attending a screening of his upcoming film Hereditary held at Metrograph on Tuesday (June 5) in New York City. The brothers posed for several silly photos together and were joined by their parents Michael and Polly, as well as Alex‘s girlfriend Gianna Reisen. Also in attendance were Alex‘s co-stars Toni Collette, Gabriel Byrne and Milly Shapiro, and director Ari Aster. Here’s a synopsis for the movie: When the matriarch of the Graham family passes away, her daughter’s family begins to unravel cryptic and increasingly terrifying secrets about their ancestry. Hereditary hits theaters THIS Friday (June 8). Alex Wolff and Asa Butterfield brought their new flick The House Of Tomorrow to NYC! The cast mates stepped out at the movie’s premiere on Tuesday evening (April 17) at Symphony Space in New York City. They were also joined by their co-stars Maude Apatow and Ellen Burstyn. The film follows a sheltered, socially-awkward teen who becomes friends with a green-haired heart transplant patient who introduces him to punk rock. Make sure to check out the trailer for the movie! The House Of Tomorrow is set to hit theaters on April 20th.